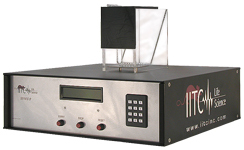 The IITC Incapacitance Test Meter is used for test assessment of pain and or inflammation of the hind limbs on mice and rats. It overcomes the drawbacks of other methods that might cause unnececessary stress or subjectivity on the animal. The technique known as dynamic weight bearing enables the test on both limbs allowing a clean stress free correlation to the paw pressure test. Control and testing can be done on the same animal at the same time. Animals are placed in the supplied rodent restrainers. Hind limbs rest on the two weight averaging platform pads. As the animal shifts their weight from each pad, the unit records the average weight in grams over a selectable test period of 5 to 999 seconds. Alphanumeric readout displays the weight of both limbs and testing start and stop features. These features are controlled on the front panel: Start, stop, reset. The standard holder that is supplied is for adult mice and rats 180-270 grams. Other sizes are available inquiry within. When the system is used on birds the system is supplied with a custom stand allowing bird Incapacitance tests.